Sanjay Joshi is the founder of Wonderland Montessori Academy, an educational institution which helps children think critically, work collaboratively, and act boldly while staying true to the Authentic Montessori Philosophy. He is devoted to creating the perfect education experience at all locations nationwide. His devotion and continued vision are clearly portrayed at Wonderland Montessori Academy through the rewarding experience provided to the children, parents, and teachers. In addition to his continued devotion to Wonderland Montessori Academy, Sanjay is a highly recognized entrepreneurial role-model. His entrepreneurial drive and dedication matched with his generous nature have not gone unnoticed, Sanjay has received a number of prestigious awards and recognition throughout his professional journey. 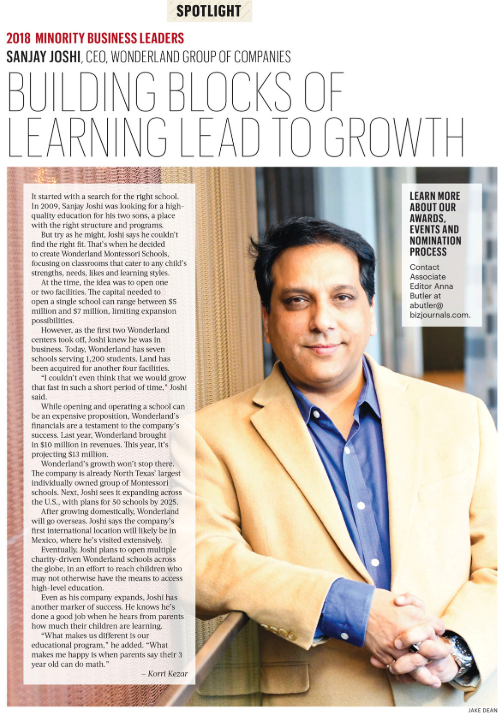 A bright future continues ahead for Wonderland, after just eight years Sanjay has successfully opened seven best in class Montessori schools enriching the lives of over 1,200 students and employing 200 exceptional staff members. Sanjay has a strong vision and structured roadmap focused on guiding Wonderland to prosper for decades to come. Governor Gregg Abbott presented Sanjay with Entrepreneur of the Year from (GDAACC) Greater Dallas Asian American Chamber of Commerce, in 2017. Alongside Pepsi CEO Indira Nooyi, Sanjay was awarded the Stardust Global Icon Award for Business Growth and Furthering Education, in 2017. Dallas Business Journal presented Sanjay with the Minority Business Leader Award in 2018. Pavithra Rajendran (Executive Assistant) for CEO.